The ever continuing fun with marketing continues..
Linkedin offered very welcome free coffee in Union Square today. Rupert Murdoch was much derided for his attempt to promote the use of pay walls (The requirement to pay before receiving access to the site), but the New York Times and others are singing the same tune with their support of Steve Brill’s Press+ paywall software. The New York Times have announced they are going to use it for some of their blogs though they haven’t announced which blogs yet. Rupert Murdoch described two kinds of readers. Those who arrive through search engines, about which the content provider has minimal information, and loyal readers. He has difficulty monetizing the fleeting search arrivals and relies on the demographics of the loyal readers to sell advertising opportunities to those with significant advertising budgets. The resulting conclusion that this search traffic must be behind a pay wall was derided by many commentators as nostalgic nonsense. Maybe Mr Murdoch is just dealing with the reality that search driven traffic comes with insufficient data to allow advertising to pay for the cost of paying journalists. While loyal readers and advertising may pay for the lower costs of digital content for main stream content there is going to be a section or category of content which can’t raise, say $200 per story, and for these more specialized articles to be written by paid journalists there needs to be some kind of pay wall model. It is easy to imagine this for specialized trade press particularly targeting high margin businesses such as financial services but what isn’t yet clear is how large the paid market is under main stream brands such as the New York Times or the New York Post. Outside of high volume advertising based model, and the paywall model, the remaining models are of sponsorship, subsidy, pro-am journalism and advertorial where there is no attempt to make significant revenue directly from the content. The recent comments by Jeff Jarvis regarding hyper local content and CUNY’s venture with the New York Times are leading in this third direction with a combined pro-am and advertorial flavor maintained with minimal advertising revenue. All of these models will inevitably exist for different kinds of content both for separate publications or combined within different sections of the same publications. We just need to let things settle out and see how much content is going to be consumed under each model. Why have you joined twitter when you are already on facebook? Judging by the often overlooked question on the Twitter page, “What are you doing?” the original intention when twitter’s layout was designed was to resolve the presence problem. That is the problem that we want to know what somebody is doing, before we interrupt them. It is why we don’t call people on their cell phone when they are away from their desk in an office environment and is a major barrier to the flow of effective business communication. Status indication, even from your phone, is already available on facebook but in practice that isn’t what Twitter is being used for. Twitter is being used for water cooler conversation. It is a business social environment with minimal profile information. Like linkedIn it has no photo sharing or cluttered graphics resulting in a more business acceptable presence. As a result it has attracted a more professionally chattering classes demographic. Lifeblogging, the logging in diary fashion of what you are doing, is uncompelling for others and the popular accounts are in reality supplying a little relationship building chatter such as Jeff Pulver’s discussions of the Miami sunrise, together with short form URLs which push their or other’s material. So maybe this is the long awaited push media. Maybe we accept push media from a friend or somebody we chose to follow. Is it just an inefficient version of Digg? Possibly. Or maybe the network building features on delicious. As such, Twitter is very inefficient. I can’t quickly see a list of Scoble’s links for the day. Or a ranking of links from CES this week. So, if it is so inefficient, why are people using it? While for most people spending too much time at the water cooler is an indication that they need a different role, for some it is an important element of their work. Journalists want to know what the current topics of chatter are and PR people need to create awareness and chatter in a forum where journalists spend time. But what about the general users of Twitter? I think the answer may be in the prominence given to the number of followers. It is feeding into the need for social affirmation by giving people a ranking. Telling people they are influential or even that they have authority. It has in many ways become a game where people compete to have the highest number of followers or the highest ranking on Twitter ranking sites. The high score seeking is a driving attraction. We are told when every new follower begins following and bad news is overlooked as they leave without any direct indication on the site. That isn’t the end to the bad news. Many of the accounts are silent, but worse, many people subscribed to a large group, were overwhelmed, and never logged in again. If you read the 2000th page of Scoble’s followers exactly 50% haven’t published in the last month and half of those haven’t published in the last six months. The unanswered question is how many of the silent accounts are inactive. Significantly there is no last login date shown. The other issue is that many may not be reading those they follow. Anybody following more than 200 people isn’t reading the content. The accounts with large numbers of followers inevitably make up a large proportion of the following. Could it be that other than the PR world and journalists others are not really reading twitter? That they are self selecting out and that is why we see so many bloggers and marketing people left. Well, there are readers. With some of the short link sites used on twitter it is possible to track the number of clicks on the short URL and the click through ratio of these links is often as much as 10% of followers. One possible benefit of Twitter is that people are more effectively selecting who they follow based on the chatter and as a result getting more effective results than on Digg or delicious. This is difficult to judge. A lot of focus around Twitter is on the most followed accounts. It is noticeable that the most followed accounts, not driven by external fame, have extremely short bios. This is probably because the short bio does not cause anybody to self select out and a high proportion follow. Some of the most followed such as the Digg Nation team have acquired their followers as a fun club ranking tool rather than for, or as, a result of any tweets they have communicated over the site. Twitter needs to become more compelling to read. A user interface where the regular columnists are in sections as they would be in print. A ranking can be included and preferably driven by ones self selected network. Then twitter becomes an index to the short form, shall I call them headlines? which lead one to occasional reading of links into more in depth discussion on a blog or at an established media site. I was struck by a recent tweet in response to another: “Was that really a necessary tweet?”. Well I’m not sure I have ever seen a necessary tweet. Or rather, I haven’t seen an important tweet but I have enjoyed many frivolous tweets. It is indeed more entertaining than delicious. It is water cooler conversation and occasionally one needs to turn away from ones work and have some social context. The clicks generated by the 10% of followers have a value but readers with things to do will only spend occasional time at the water cooler and if that time is too occasional they won’t play this game. For that reason the site needs to continue to evolve to be more readable or be replaced. Newspaper readership is continuing to decline. We continue to read messages directly from companies and governments while still getting news of incidents from a traditional news source for free online. Layoffs at newspapers continue a pace. The amount of non paid add space is noticably declining in a number of publications and even on television despite it being an election year. Jeff Jarvis has posted a presentation on the current state of the news industry here. Can advertising pay for bandwidth costs? The internet isn’t free. If you have a significant amount of traffic your hosting provider will start charging you or constrain your account in some way. When it comes to video content most amateur producers are using the likes of YouTube or BlipTV to distribute their videos. They are getting approximately half the revenue where there is any. The adds are typically a single placement before or after (‘preroll’ and ‘postroll’) or small adds popping up during the content (‘overlay’). The problem is that the infrastructure has to be paid for. In the case of YouTube it is being subsidised by Google as well as its original venture capital like the other players. Major players such as TimeWarner are receiving revenue from preroll and postroll advertising and probably paying fairly directly for their infrastructure and production overhead which is a large part of the slow provision of these services. What that infrastructure costs isn’t clear but as a guide we know that at the retail level traffic costs are as low as 25c/Gb. A typical recurring video might be anything from 0.1Gb to 1Gb depending on the duration and resolution. That gives a cost of 2.5c to 25c per viewer. Google has bought a lot of fiber and will be able to serve video at a significantly lower cost by providing their own network. Others will be using brightcove etc. in order to get economies of network scale at some unknown cost. The retail figures give a range of cost range per thousand viewers of $25 to $250 for traffic charges. Television advertising typically realises $30 per thousand viewers (CPM) but can vary from $5 to $50 depending on the region, time of the week and program. Internet video advertisements typically realize less than one dollar but fall within the range of $0.25 /CPM and $5.00. Television programs in the US typically include 12 minutes per hour or approximately 8 advertisements of 30 seconds in twenty minutes of air time. So television might realise $240/CPM for twenty minutes. Internet video might realize for preroll,postroll and overlay as much as $1.50 to $6.00 /CPM across a much smaller audiance. So infrastructure costs need to be significantly lower or somebody else needs to be paying them to allow the current advertising revenue model to be profitable. There are legitimate reasons why internet advertising realizes a much lower CPM due largely to the low barriers to entry and resulting low premium. There is an assumption that advertising will support internet video because television is supported by advertising but this doesn’t necessarily follow. The constrained access to television made it a premium product and added credibility to the content and advertising. The economics of broadcast television, which is still what provides significant theoretical viewer numbers to television, was based on a cheap distribution method which could be paid for with commercials. This isn’t necessarily true of an infrastructure which requires physical installation to the consumer’s premises and servers which consume over 1% of the electricity in the US. The energy costs aren’t decisive. It is the infrastructure cost that needs to be reduced, both for the servers and the distribution, if advertising is to be the sole basis of the model. 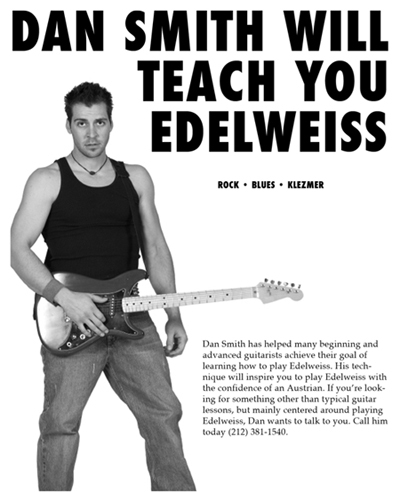 If you have ever lived in New York you will vaguely remember the posters of Dan Smith offering to teach you guitar. It is posted in every shop window across Manhattan. What it does to an individual to have such a public persona I can only guess at but over several variations of the poster he has presumably found that it is a message that works. It is quite noticeable that several others have tried to copy his general format for other services such as a local PC repair guy. I always I assumed that he had some distributor posting the flyers up. There are several groups who post posters on temporary construction walls around town for record companies and film studios. However I would have been wrong. According to an article here by a David Kaufmann, who applied for lessons in order to get the back story, he actually manages to post all of the flyers himself. By doing so he is able to charge double what several reputable schools charge for guitar lessons and has people pre-book for a course. The latest version of his poster with a milder demeanor and a seated position can be found on flickr here. The prevalence of his marketing campaign has also let to a number of spoofs including for the film, The Love Guru, but an impressively long list was collected by tinagirlspy@flickr.com below. I’m very impressed that one person is able to get so much publicity and operate it all as a one man band. To countless imitators and/or parodies of his flyers-here are just a few…..
…but that’s because the guys in Nuclear O’Reilly ROCK!!! Even John Mayer has gotten into the act….. It took me some time to get to putting my own photo at the top of this blog and a suited photo on the corporate site I still find to be one of the scariest disembodied photos on the internet. It really does appear that every small consultancy shows their principal, management or leadership team but there are also some examples of people who maybe took it too far, as maybe Dan Smith has. The variety ranges from the tasteful to the salesy to the excessive. Or maybe they all work!